The Leptophlebia Vespertina and Marginata are the first mayflies that produces decent fly fishing conditions in still water in Norway. 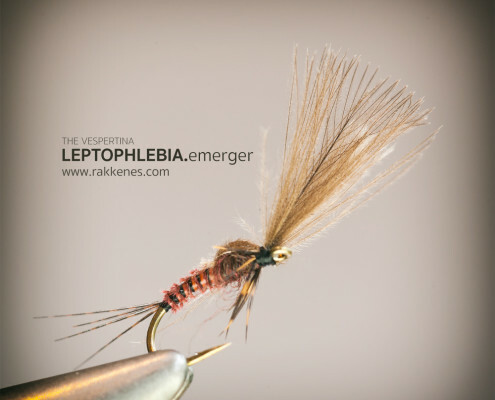 This Leptophlebia Vespertina Emerger is both a fast tie and an efficient pattern for attacking the Vespertina hatch. 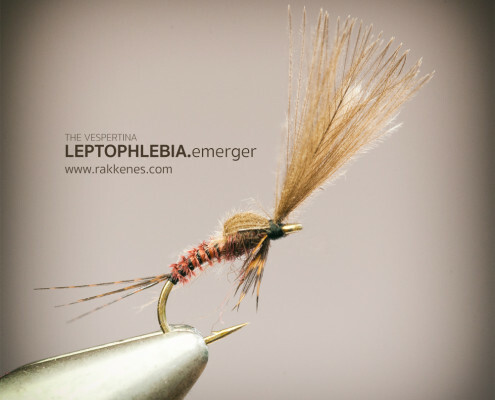 The credit for this one goes to Rune Stokkebekk – a Norwegian fly tier. The Marginata is the big sister of the smaller Vespertina. Only a few weeks after the ice has left forest ponds and waters, the Marginata start appearing. In my waters you should start looking out for these vanguards of the mayflies from May. Even if the Leptophlebia Vespertina and Marginata look the same in different sizes, they act a bit differently. The larger Marginata often hatch on land (stones, straws, reeds, etc), but the Vespertina hatch in the water film. Therefore, I usually fish the emerger pattern when the Vespertina is on – a few weeks later than the Marginata hatch. The hook size for the Vespertina is 14-16, and the Marginata is tied on 12-14. A good tip is to focus on the emerger and the nymph when the Vespertina is on. When the Marginata is hatching, turn to the dun and the nymph. This emerger is really a standard pattern with a CdC floating element in the thorax. You could tie it as a bubble (se an example here), or do it as I have done in this example. The fly floats a bit lower in the water, and the top of the CdC feather keeps the bug floating and visible to the fly fisher. During my years of fly fishing, I have however found that it’s easier to tie a well presented abdomen and thorax this way. Apply a good floatant, such as CdC Oil or Dry Dip Super on the CdC tip. This is fished like a usual dry may fly.